Personnel – Dave Morecroft: keyboards, vocals; Tim Ower: saxophone; Raphael Clarkson: trombone, vocals; Arthur O’Hara: bass; Harry Pope: drums. 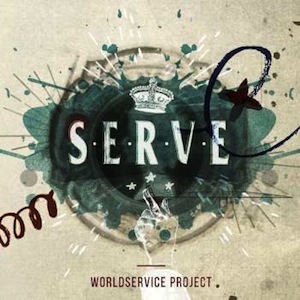 Serve, the fourth album by London-based quintet WorldService Project, is composed of eight energetic tracks whose musical irreverence derives from a blend of impactful punk rock, stimulating funk, authoritative heavy metal, and light jazz. “Plagued With Righteousness” links passages that can go from acutely boisterous to soaringly atmospheric. The piece is a confluence of funk groove a-la Morphine and classic heavy metal with an easy melodicism, more in the line of Scorpions than Judas Priest. While the trombonist spreads energizing lines, keyboardist Dave Morecroft, the band’s principal composer, solos like if he had a guitar in his hands. Sometimes disruptive, sometimes ultra-compact, “Dai Jo Bo” is a spunky punk exercise punctuated by a mild groove, horn ostinatos, and funky keyboard accompaniment. Playful, brassy, and burlesque, “The Tale Of Mr.Giggles” adds a vocalized narration to the initial Charleston-style rim-clicks, intensifying the rock posture along the way with an effect-drenched trombone solo. Also, “Runner” is quite playful, hooking in a repetitive Balkan-like riff before displaying a gorgeously intense sax-over-drums discharge as if it was announcing an acrobatic circus number. The final ramp inflates the adopted celebratory posture. Words in English, Italian, French and German play an important role on “Now This Means War”, whose heavy textures are built with predictable power chord sequences. While “Ease” is rhythmically daring, exhibiting a singable riff at the end, “To Lose The Loved” contains naive melodies and a snare-induced marching passage with vibrant bass pumps. “False Prophets” concludes the album as a static jazzified exercise at first that develops gradually toward a crescendo of distorted harmonies with vocals and horn outcries atop. The rebellious attitude of the quintet is well alive, but some aspects of their sound feel a bit rigid, carrying a commercial tongue-in-cheek side that was not so attractive to me. I’m convinced this music should work better when played live.